One of the 3 biggest questions I had about Johnny Manziel was is he willing to work hard enough to become the QB that his natural athleticism indicates he can be. So far, I am not impressed by that aspect of Manziel. His actions as he was walking across the stage after being taken by the Browns concerned me. That is not the time to be doing the “show me the money” crap. The Browns clearly had issues with the way he was carrying himself by the “act like a backup” comment. But they should have known what they were getting when they picked him in the first round. Be careful what you wish for. You might just get it. This weekend we saw Johnny hanging out in Vegas with the broken Gronc. We saw the girls and the money sign again. He realized that he looked bad and posted a picture of his playbook tablet trying to make up for his bad PR. But that only made it worse. Here is the bottom line. Manziel has a lot to learn. He is not as NFL ready as Teddy Bridgewater due to the O that Manziel played in. He will have to do the tape work necessary to become a successful QB. So far there is no indication he has the desire to do that. He seems to be more interested in being an Internet superstar rather than a football superstar. 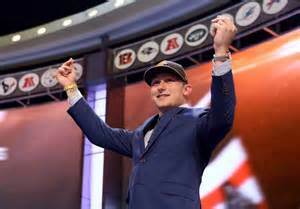 The future of both the Browns and GM Ray Farmer depends upon Manziel becoming a quality starting QB. That is not the kind of bet that I would make if my job depended on it.